The TDI Helitrox Diver course examines the theory, methods, and procedures for planning staged decompression dives utilising helium in the breathing mixture to reduce the effects of inert gas narcosis. The TDI Helitrox Diver course trains divers how to plan and conduct staged decompression dives to a maximum depth of 45 metres/150 feet. 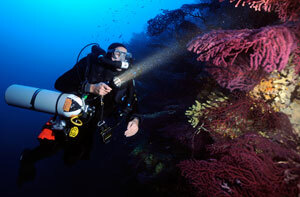 The most common equipment requirements, gear set-up, and decompression techniques are also presented during this course. Students are permitted to utilise enriched air nitrox and helium mixes with no greater than 20% helium content, and up to 100% oxygen for decompression diving.